NSP Strategy: A.I. Will Eat Your Job! A.I. Will Eat Your Job! Robots are going to eat jobs. Already are, but it is going to accelerate. 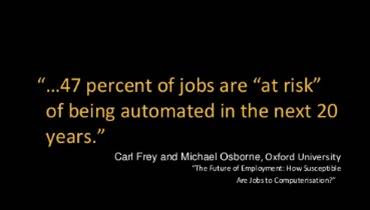 40%+ of jobs are at risk of being automated! 4 skills that will stave it off: (1) code; (2) consultative selling; (3) problem solving; (4) creative thinking. Be a Linchpin.